Kerrville was buzzing on January 27, 1931 when a Packard touring car, carrying the most famous entertainer in America, rolled to a stop in front of Schreiner's Store. 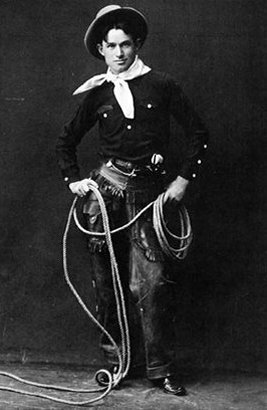 Will Rogers was a cowboy, humorist, standup comedian, and stage and movie actor. He was one of the most famous media stars of the 1920s and 30s. His stage act consisted of chewing gum, twirling a rope, and telling jokes. In 1931 he did a series of shows in Texas raising money for victims of the recent drought. He traveled at his own expense. He was in Austin on Monday night; then flew into San Antonio on Tuesday, touching down at 5pm. The Alamo City like most of Texas was bone dry, but that evening there was thunder and lightning to the west. Just before midnight, it began to rain. Rogers traveled across Texas with a group that included former big league baseball player and manager Tris Speaker from Hubbard and Jimmie Rodgers from Kerrville. Jimmie Rodgers was a world famous singer and songwriter. Will Rogers called Jimmie Rodgers "that distant cousin of mine," although everyone knew they were not related. On Wednesday morning the rain fell so hard that Jimmie Rodgers had to borrow his wife's Packard to get himself, Will Rogers, and the rest of the entourage to their next gig in San Angelo. The Packard left San Antonio at noon, drove through Boerne and Comfort, and arrived in Kerrville at 2:30. It pulled up next to the curb at Schreiner's Store on Water Street. Will Rogers chatted out the window and shook hands with a crowd of people standing in the rain. The Rogers' group then stopped at "Blue Yodeler's Paradise," Jimmie Rodgers home at 617 Main Street, for lunch. After that it was on to San Angelo. They made it just in time for the 8 o'clock show. That night Rogers poked fun at politicians and joked about himself. He reminded the crowd that he never graduated from high school, but he was rich in life experiences. Until his death in a plane crash on August 15, 1935, Will Rogers was the most beloved personality in America. There was talk of nominating him for president, but he never seriously considered it. San Antonio Light, January 27, 1931, p 2A. Kerrville Daily Times, January 29, 1931, "Will Rogers in Kerrville On His Way To San Angelo," p1.